A very reliable early cropping vegetable, becoming less popular until trendy young chefs rediscovered them recently. Whole young pods and leaf tips can be harvested, as well as the main crop, the beans themselves. 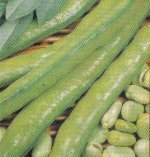 Broad beans are divided into three main types: Long pod, which have kidney-shaped beans; Windsor, with rounder beans and shorter pods; and the dwarf varieties, which can be of either shape. Relon - longpod green - pods up to 50cm (20") long! Sow outdoors direct in March to April, or October to December in milder areas to overwinter. Space 22-30cm (9-12") each way according to plant size, or in double rows 60cm (2') apart. Sow 3.5-5cm (1½-2") deep. Earlier crops can be obtained by sowing in pots in January to February and transplanting in March. Provide support with canes and twine, or peasticks for dwarf varieties. Nip out tips when in full flower to discourage blackfly and encourage bean production. Watering is only needed in very dry years until flowers are produced, then 4 gallons per sq yard per week, unless the weather is very wet. Overwintered and transplanted crops can be picked from May to July, others July to September. The main pest is black bean aphid, which can completely cover the entire surface of the plant if steps are not taken early enough. The best treatment is a soft soap or fatty acid spray, although pinching out the tips of the plants is supposed to be effective. However, when I grew them last, I found this didn't work - on the other hand, I was living in east London, an area where there was probably a shortage of other food for them!